Mini pita bread hand pies with feta cheese. I cannot wait to share this recipe with you. 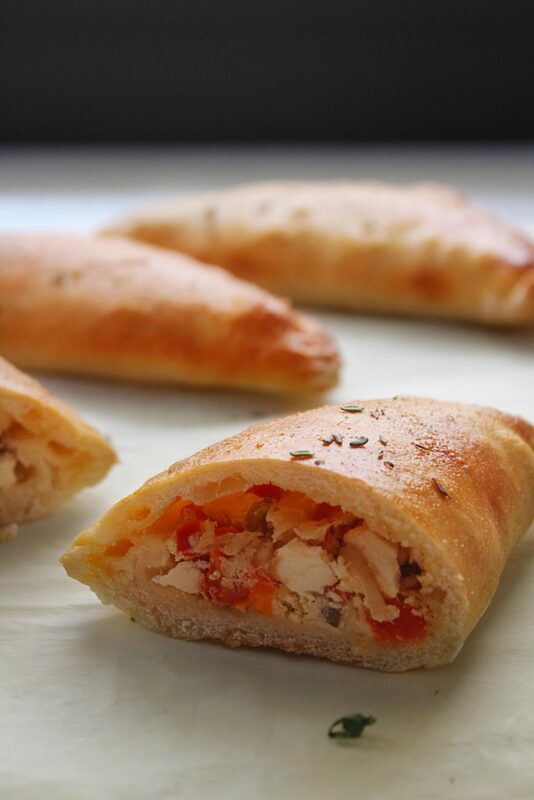 The ultimate 100% homemade Greek pita bread dough folded over a delicious feta cheese and red pepper stuffing. Make it my way: hand-held mini pies. Eat them for breakfast, brunch, pack them wherever you go: at work, on a picnic, serve them for your party or any other occasion, fancy or casual. Serve them with a salad like this marvelous cabbage salad and you got a scrumptious and nutritious meal. Freeze them and save some for the following crazy week when you have no time to breathe. I got another bonus, at least in my book: no need for forks or plates! Save on mess brothers and sisters! 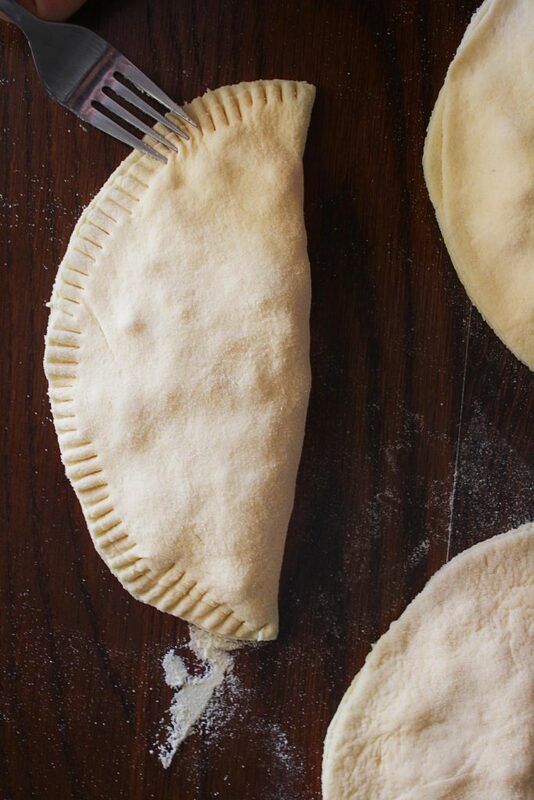 It is somehow crazy to post this pita bread pies before even posted the pita bread recipe but why not? I can do whatever I like in my webspace, right? They were so delicious that my kids were fighting over the last mini pie and I hardy saved a few for shooting. I was so excited about the outcome of that recipe that I immediately grabbed my camera for the shooting and later that day the words came out so right for this post. This time. For a change. Writing a post is still a struggle for me since English isn’t my mother tongue and I have to check every single sentence again and again and it’s usually so hard and frustrating. Nailed it! The slightly sweet and nutty flavor of the pita bread blends like a charm with the creamy and peppery feta cheese, the sweetness of red pepper and the Mediterranean herbs. 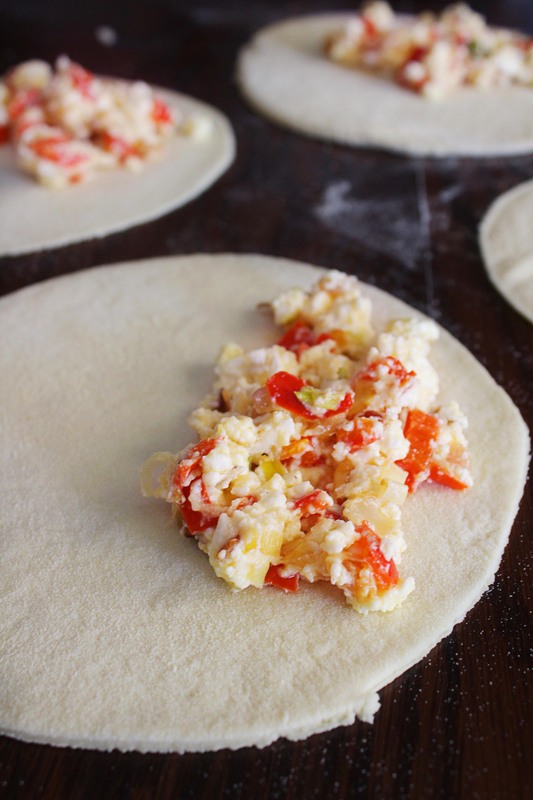 Therefore, here they come, my mini pita bread hand pies with feta cheese and red bell pepper. This recipe gives you the space for using up a great variety of veggies for the filling. Apart from the dough, keep only feta cheese that offers the creamy and cheesy delightful flavor and the eggs that bind all ingredients together. I recommend an aromatic Greek white wine like Savatiano. Enjoy and tell me how it went. Share your photos on my Instagram account and follow me there for more recipes, meal ideas and much more. #1 No need for additional salt because feta cheese will do all the work. #2 Use hard flour. You won’t get the same outcome with all-purpose flour. Higher amounts of protein from hard flour will produce gluten that will give to the dough stretch and elasticity and the characteristic chewy texture of pita bread. #3 We simply need a smooth but hard dough. Follow the instructions and add little water ONLY if the dough is too sticky. Don’t over knead the dough. If it is smooth enough, let it double its size and gluten will do the rest for you. #4 Don’t skip vinegar because it will produce even more elasticity. 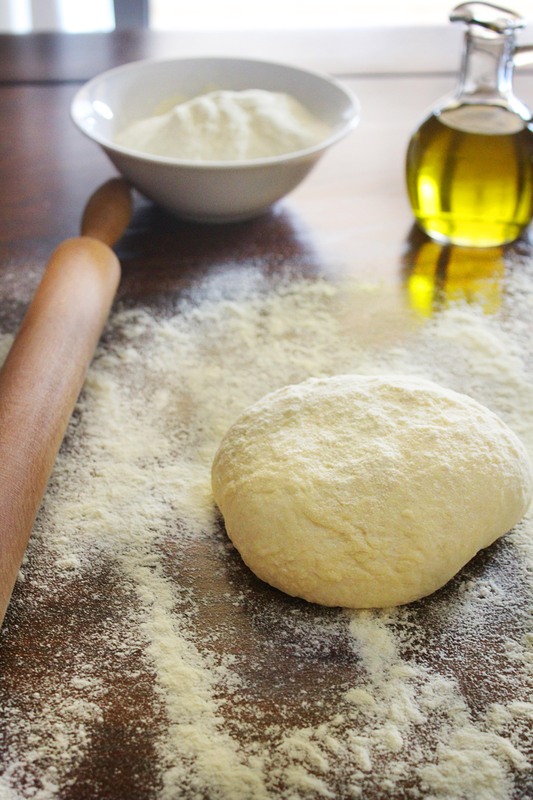 #5 I recommend durum or semolina flour for rolling the dough for one very important reason. This flour’s texture is heavier and coarser than most milled flours. It won’t absorb the moisture of the dough and make the dough hard enough to roll and not as chewy as a traditional pita bread should be. Credits: The pita bread recipe is not mine. I have to thank mamangelic one of the best Greek food bloggers, nutritionist, and an excellent photographer. Thank you mamangelic for this wonderful recipe amongst many others. We have enjoyed countless meals with this homemade pita bread thanks to you. Dissolve yeast in ½ cup warm water. It needs 4-5 minutes to activate. Meanwhile, in a medium mixing bowl, combine all ingredients with a spoon (the rest of water, vinegar, salt, honey, flour). Knead the dough in the bowl for about 5 minutes until it becomes smooth. Add very small amounts of extra hard flour if the dough is extremely sticky. Alternatively, knead dough at medium speed in a stand mixer fitted with the dough hook attachment about 1-2 minutes. Cover bowl with a damp cloth and let rise (double its size) in a warm place for 30 minutes to 1 hour. Meanwhile, in a saucepan add olive oil over medium heat. Add onion, leek, thyme and sauté for 3 minutes. Add spring onion, red pepper for another 10 minutes. Remove from heat and let aside to cool. Combine 2 scrambled eggs, crumbled feta. Mix well and let aside. When the dough has doubled, punch it down and transfer to a lightly floured (use durum or semolina flour) work surface. Cut into 6-10 even pieces. Form each dough piece into an even ball. 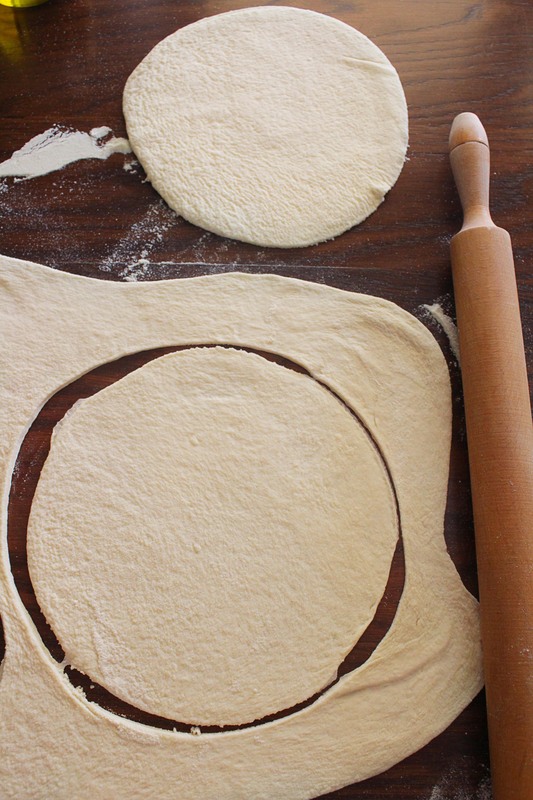 Roll each piece of dough into circle, no more than ¼ inch thick, taking care not to tear dough and keeping the thickness even all around. Use a round cutter or just a plate (I used a 7.8-inch plate) or any other size you prefer. Cut into even pieces and get neat edges. Brush the edge of one of the pastry circles with egg wash and place some filling in the middle. Take 1-3 tablespoons (according to the size of the disk) of the feta-pepper mixture and place in the middle of each disc. 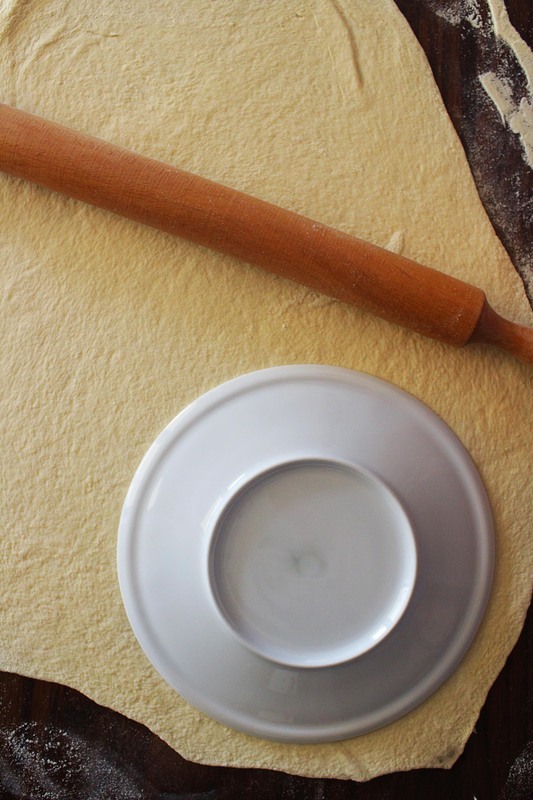 Use a pastry brush to place the egg wash on the outer edges of the disc. Fold the disc over and gently press the edges to seal. With a fork press around the edges to seal well enough. Brush the top with egg wash. 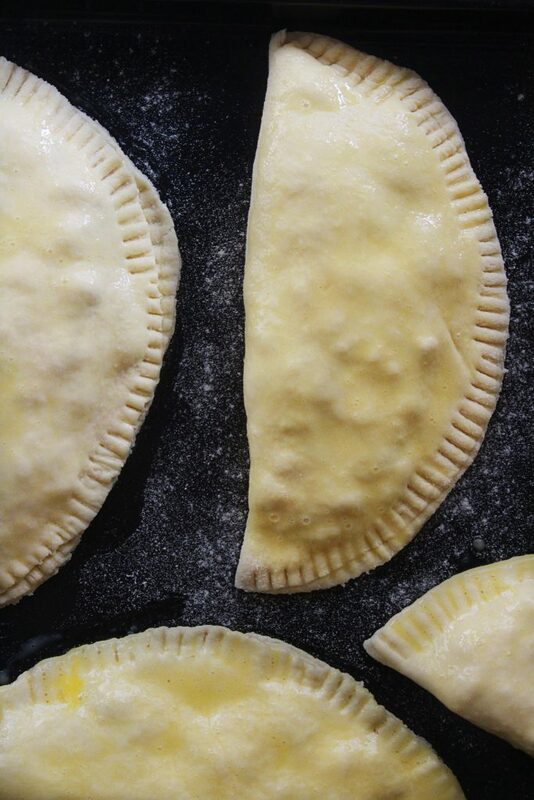 Carefully place them on a baking sheet lined with parchment paper. Leave about 1 inch of space between the pies on the baking sheet. Will you look at this dish? Pan seared shrimps tossed with herbs and spices, served over a creamy, luscious yellow split pea puree and paired with lemony parsley pesto. This is a vibrant, bursting with Mediterranean flavor dish that is seriously filling, quite simple to fix up and delightful to eat. These mini pies are rich in feta flavor. 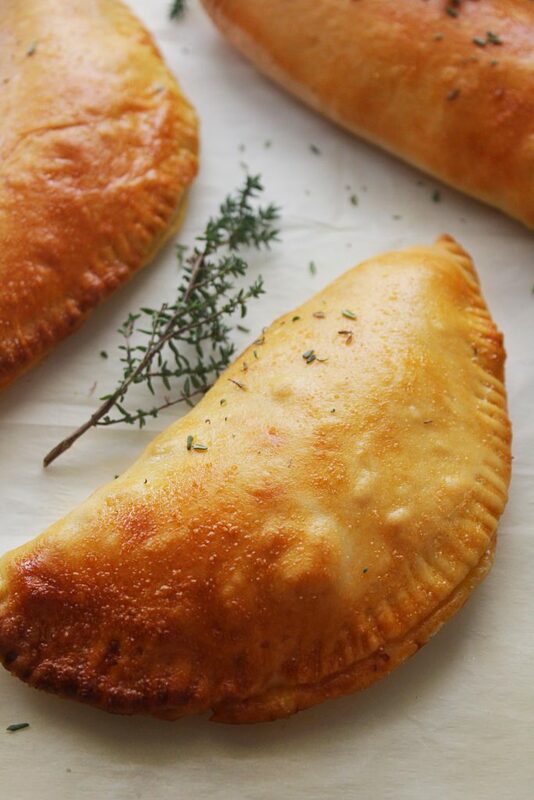 They are a quick thing to both make and eat and they are great to have on hand. I like to eat mine for breakfast! Thank you. So true. They are delicious and handy…Enjoy!!! What do you mean by hard flour? Hello! Thank you for stopping by! Hard flour is also known as bread flour and strong flour.